Please refer to our stock # 147 when inquiring. 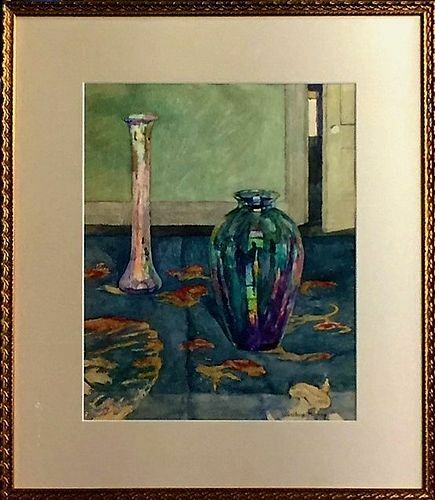 "Vases On The Rug" watercolor on paper. View size 16 3/4" x 13 3/4", framed 24 3/4" x 21 3/4" Winthrop Duthie Turney was born in New York City and studied at the Art Students League. He was a member of the Fifteen Gallery Group, Allied Artists of America, Brooklyn Society of Modern Artists and the National Society of Mural Painters. Turney exhibited widely, including the Allied Artists of America (which awarded him a prize in 1944), Museum of Modern Art, and the Whitney Museum of American Art. He is currently exhibited at the Brooklyn Museum of Art and the Smithsonian American Art Museum. He is listed in Who Was Who in American Art, Dictionary of American Artists, Mallett, Davenports, Fieldings, The Artists Blue Book and numerous other publications. He and his wife spent summers painting in Gloucester, Mass. and Mountainville, N.Y. His work shows the influence of these locations and his primary residence in Brooklyn. He painted in both oils and watercolor, painting still lifes as well as urban portraits on the subway and streets of Brooklyn that emerged from his mural work for the WPA in the 1930s. He along with his wife Agnes Richmond have become highly collected artists. Winthrop's powerful auction records and gallery prices speak volumes as to how highly regarded an artist he has become.